Posted September 26, 2014 by Admin & filed under News. Autumn is fast approaching, evenings are drawing in and the leaves are falling from the trees – where does the time go? Apollo launched in February this year and already over 7300 people have visited Apollo, viewing over 40,000 pages! The most used pages at this time are from the Showing How I spend my time section (Job Planning and Service Summary) and Getting Started and Talking to Others about my work. The Resources and Evidence pages are also well visited, with many commenting on how helpful it is to have access to the best available evidence on specialist nursing at the touch of a download button! You may have seen that both the Job Plan and Service Summary can now be downloaded as Word documents. This change means that you can make any changes or additions to the documents at any time. The home page has also changed, if you scroll down you will see a section New Additions to Apollo and below that a News section. These two areas will keep you appraised of the changes and news items added to Apollo. The last seven months has seen Apollo far busier than we had expected, which is fantastic. We have added new resources addressing areas/topics that you have requested ; 6C’s, Business Planning & Finance, Integrated Pathways. But we also need to consolidate the resources we have produced and expand on some of the examples and evidence we have. We want to share your ideas! This is where you come in – please! If you have used any of the resources and produced documents for your service would you share them with Apollo? We could share your work, write a news piece outlining the contribution you have made and place your work within the resources section.Contact us and share your ideas and contributions. This is very much the philosophy that underpins Apollo, working together to amplify the voice of specialist nurses, a collaboration to expand the evidence to demonstrate the value of your work.Given that we need to consolidate some of the resources on Apollo, what additions would you like to see? What would help you to articulate the value of your service? Apollo’s good but its not telepathic… Apollo’s remit, it’s raisin d’être, is to support specialist nurses speak about the value, impact and outcomes of the services they provide for patients, so please do tell us how we can help you. Finally can you help spread the word about Apollo? 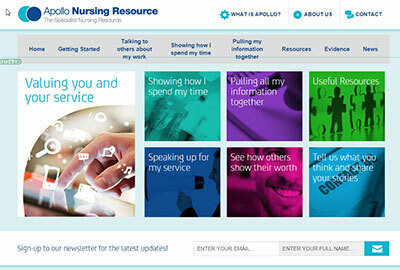 Share the website link with your colleagues at work or your friends within the specialist nursing community? By doing this you will be amplifying the reach and voice of specialist nursing and building a community which is stepping up together. At the time of writing this, twitter reliably informs me there are 89 more sleeps till Christmas, on that note I will sign off by reminding you that Apollo might not be able to do your Christmas shopping for you, but if you feel challenged by demands to demonstrate your worth – Apollo is here to help. Together we can assist each other to grow stronger and become more visible.